Finally after AT&T’s hold off on Android devices ended, they’re looking to add some meat to their roster. 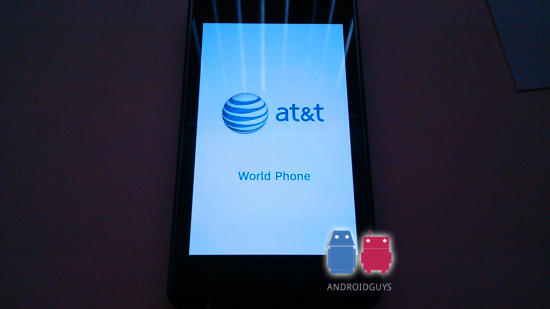 Aside from the Nexus One, AT&T doesn’t have a real high end Android phone. Rumors today at a re-branded Samsung Galaxy S might be making its way to AT&T. Looks like it will be released as the Samsung i897, that’s the same model that popped up a while back on a Bluetooth special interest group’s site. Back then it was also thought that the i897 was a variant of the Galaxy S, but story just died down, until now. If you remember the Galaxy S was unveiled a CTIA, it made a really good first impression on a lot of people. It was Samsung’s first real Android powered “superphone.” The Galaxy S has really impressive specs, including a beautiful 4″ inch Super AMOLED display and a 5 megapixel camera. The phone definitely turned a lot heads, everyone just wanted to know when and where they could get their hands on it. Now it looks like the Galaxy S has reemerged as the i897, with an AT&T logo. An exclusive from the boys at AndroidGuys shows the mystery device is very similar to the Galaxy S, at least in looks. Originally the two were thought to be nearly identical, but today’s leak tells us that new i897 will have a faster 1GHZ processor. The Galaxy S is said to have 800MHz ARM based CPU. Right now it’s unclear if the new processor is a Snapdragon, but if I had to guess, I would say, yes. The new i897 is said to be running Android 2.1, with the new TouchWiz 3.0 interface, which also is on the Galaxy S.
That’s all there really is as of right now. There is no official confirmation from either AT&T or Samsung. But the phone that we see today looks very much like a final product, so a launch could just be right around the corner. Check out the AndroidGuys article for a full set of pics. 8 Responses to Re-branded Samsung Galaxy S Coming to AT&T? This is the Hummingbird processor – not Snapdragon which is slower. I can advise that no, it will not be an 800 MHz CPU in the Galaxy S which will have a 1GHz CPU but it will not be a Hummingbird. Instead it will have a Samsung processor which co-incidentally offers astounding graphics performance (google galaxy s triangles per second). The information about the Galaxy S i9000 is readily available on Google. The specs seem pretty well finalized and launch is expected in a matter of days. Sounds like AT&T are looking at the Samsung Galaxy S no more, no less. btw, there is no information on the Samsung web site. There is one part in the article that doesn’t make much sense to me. The Galaxy S has a 1ghz hummingbird samsung arm cortex a8 processor, not 800mhz. Actually the Samsung Galaxy S has a 1ghz hummingbird. That is the processor that they were saying can process many more triangles per second than any other phone out there at CTIA. May I refer you to this blog for technical information regarding the Galaxy S ? The article makes for interesting reading. Possible June 10th release date…?